Faculty of Physical Education and Sports was founded in 2004. The way of newly formed department of Zhytomyr State University named after Ivan Franko, began under leadership, of honored worker of Physical Culture and Sports of Ukraine, Master of Sports International Class, Doctor of Physical Training and Sports, Professor Rustam Fahymovycha Akhmetov. Since 2006 the department is headed by doctor of science in physical education and sports Tamara B. Kutek. 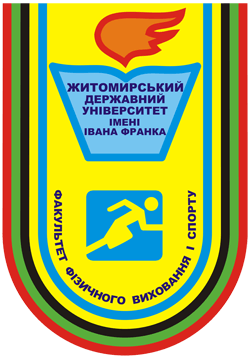 Department of Olympic and Professional Sports. V. A. Pavlovsky — Candidate of Medical Sciences, Associate Professor (Department of Sports Medicine and bases of medical knowledge, 2004-2009 years). 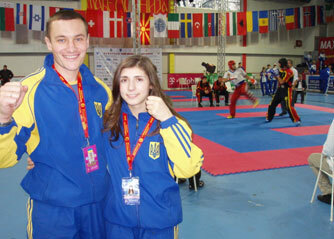 «Physical culture», specialization: geography and regional studies and tourism work. First prom was held in 2009. A total of 2004 faculty Physical Education and Sport prepared about 1469 specialists in physical culture and sports. Graduates of the faculty — teachers of physical education and coaches of various sports working in different regions of Ukraine. It should be noted that 31 graduates of the Faculty Physical Education and Sports completed training at the university with distinction. Today Training is carried in the following directions «Physical education» and «Physical education*». Graduates of specialty «Physical education» get qualification — coaches (of sport), the head of school and sports clubs extracurricular institutions, and graduates of the specialty «Physical education*» qualifications — teacher of physical culture, physical culture teacher. Educational and training and educational process, scientific and technical work carried highly qualified specialists — Doctors, Professors, Associate Professors, candidate of pedagogical sciences, candidates of sciences in Physical Education and Sport, candidates of Medical Sciences, candidates of Biological Sciences, Master of Sports, honored coach of Ukraine. The teaching staff of the department working for improving the quality of students education, diversify forms and methods of educational and training process, introduction of module-rating system of control knowledge, updating of Ukraine. The basis training of students assigned study and introduction of practices the best advanced experience professionals. At the departments working scientific and methodical seminars, subjects are aimed at improving the quality of training — educational and training process, introduction of modern advances of education, Sports Science, in the preparation upcoming industry professionals «Physical culture and sport». Providing educational — training process of students aimed at acquiring high quality knowledge, motor skills of the chosen profession, the skills to use them in practice, the organization of creative work, self-improvement. The high efficiency of scientific and educational and methodical work departments of the faculty is provided by the introduction of modern computer technology that makes it possible to intensify the learning process and prepare highly qualified specialists to work in information education. The high scientific and methodological level and professional skills of teachers allows to faculty to train future teachers of physical education and coaches of various sports in accordance with the requirements of modern education. The best graduates are recommended to study at Magistracy and postgraduate courses, which gives the right to work in higher educational establishments different levels of accreditation to raise the level of professional skills, implement acquired knowledge and skills in scientific work. Special attention at the Faculty of Physical Education and Sports paid to improvement of quality the departments. Thus, in 2014 defended their dissertations E. I. Zhukovsky and Y. S. Kostyuk (department of physical education and recreation), finish postgraduate studies in Taras Shevchenko National University of Kyiv the lecturers of the Department of Biomedical foundations of physical education and sport A. M. Lyashevych and I. S. Chernuha. At the faculty there is scientific school headed by Professor R. F. Ahmetov the direction is «Improving the control parameters of athletic training pupils and students.» As a result of scientific school headed by Professor R. F. Ahmetov defended dissertations for Candidate of Physical Education and Sports V. K. Shaverskyy (department of Olympic and Professional Sports), T. Y. Yavorska (Head of Olympic and Professional Sports), O. V. Husarevych (the department of Olympic and Professional Sports). In 2014 she defended her doctoral dissertation on specialty Olympic and Professional Sports T. B. Kutek. The lecturers of the Faculty of physical training and sports regularly take part in All-Ukrainian and International research and practice conferences. The results of scientific researches are published in domestic and international editions. During the years of functioning of the faculty the lecturers have published nearly 700 research papers among which there are scientific articles, methodological recommendations, research and methodology manuals, manuals with stamp of Ministry of Education and Science of Ukraine, textbooks, monographs. In 2014 at the Faculty of physical training and sports there was held I All-Ukrainian research and practice conference «Physical training and sports in the context of state programme of development of physical training in Ukraine: experience, problems and perspectives» and I All-Ukrainian student conference «Sport Science 2015» dedicated to the 10th anniversary of the faculty. Scientific contacts of the faculty are the cooperation with Kiev National University of physical training and sports of Ukraine, Research and Development Institute of physical training and sports, Lviv State University of physical training, Vinnytsa M. Kotsubynskii State Pedagogical University, Kiev T. Shevchenko National University, National M. P. Drahomanov Pedagogical University, Kharkiv H. Skovoroda State Pedagogical University, Kharkiv V. N. Karasin National University, Ternopil V. Hnatiuk National Pedagogical University, Volyn Lesia Ukrainka National University, Kherson State University. Scientific research work of students assumes significance. Student research society operates with great enthusiasm at the faculty. Under the guidance of professors, Doctors of Philosophy and associate professors student scientific circles and scientific problem groups function at the faculty. The results of research and development work of students were reported many times at student All-Ukrainian research and practice conferences: All-Ukrainian research and practice conference of young scientists and students «Biological Researches» (Zhytomyr), Student research and practice conference «Student Sport Science» (Zhytomyr), All-Ukraine student research and practice conference «Public initiatives of the youth — basis of social-economic reorganization of Ukraine (Kiev), International research and practice conference «Scientific researches of the present day. Edition 4» (Kiev), All-Ukrainian student research and practice conference «Physical training, sport and physical rehabilitation in the modern society» (Vinnytsa), All-Ukrainian research and practice conference «The formation of didactic competence of preschool and primary school teachers» (Zhytomyr). The best students of the faculty are the winners of I stage of All-Ukrainian Olympiad in Theory and methodology of physical training and Olympic and professional sports and annual participants of II stage of All-Ukrainian Olympiad. Traditionally to Days of science in Ukraine the round table is held at the faculty on the topic «The problems and perspectives of student science in physical training and sports» and student research and practice conference «Student sport science». Various sport mass and educational events are held at the Faculty of physical training and sports: meetings with famous sportsmen, honourable trainers, sport competitions in different kinds of sports, Day of specialists in physical training and sports, the festival of the first-year students «Hello, we are looking for talants!», Day of tourism dedicated to the World Tourism Day, Teacher’s Day, Birth Day of Zhytomyr I. Franko State University, International Students’ Day, the party «Sport fame», Day of Ukrainian Army, International Women’s Day, April Fools’ Day, the Week of the Faculty of physical training and sports, Spartakiad of the lecturers of the university dedicated to World Health Day, graduation assembly. For the preparation of future specialists in physical training and sports the faculty has modern material and technical resources: modern sporting complex (playing gym, specialized gymnastic area, workout facility for athletics and power lifting, aaerobics gym), recovery centre, open workout facility, football ground with artificial covering, IT room. 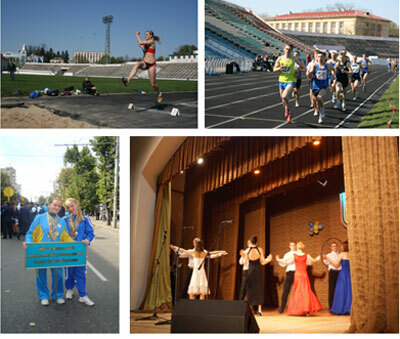 For increasing of sport skill level educational and training process is held on the best bases of the city: the central city stadium «Polissia», the light athletics track, the swimming pool of sporting complex «Avangard». For providing medical and biological disciplines at the faculty of physical training and sports two scientific research laboratories are created. Dzyubenko Nazar — master of sports in athletics, multiple champion of Ukraine relay races 4×400 m.
Achieving which has the faculty of physical education and sports are a combination of knowledge and practical skills of experienced teachers and young teachers allowing work effectively today and think optimistic about the future. Set up records many times!